. It’s huge! 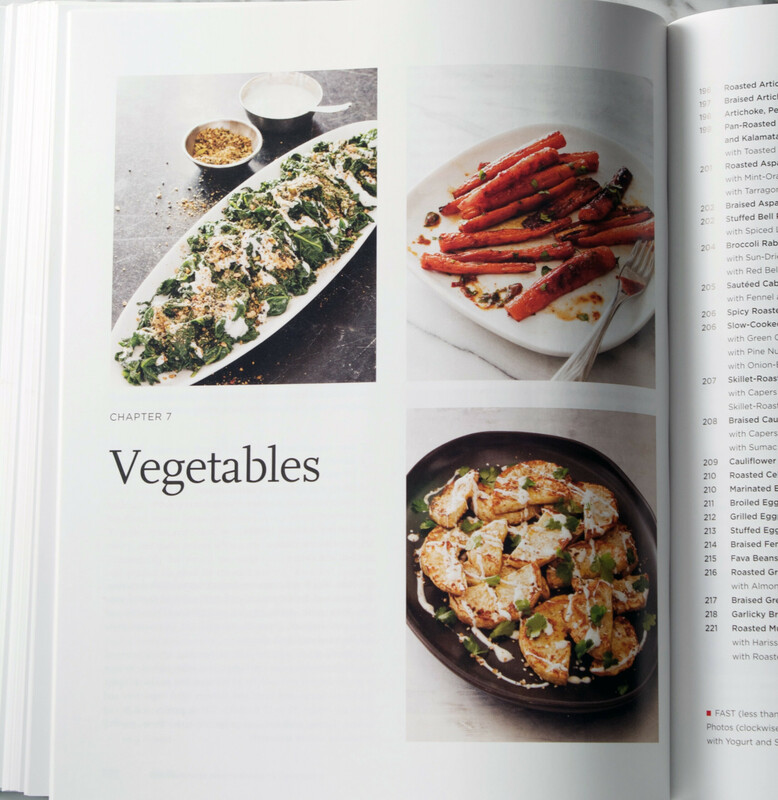 Packed with 500 new recipes, this book surpassed my expectations (even for an ATK book, you know how much I love their recipes). This Mediterranean cookbook had me intrigued from the moment I first heard it was in the works. If I had to categorize the way I eat, I would most accurately fall under the Mediterranean diet. My day-to-day consumption focuses heavily on vegetables, legumes, whole grains, dairy, and healthy fats with animal protein­ (fish and poultry) often second, or even third thought. I don’t know about you, but from time to time I find myself in a “cooking rut”, eating similar meals from week to week. So when I first flipped through this book all I could think was how excited and newly inspired I was to add variety back into my weekly meals while still maintaining a healthy outlook. These recipes are flavorful, accessible, seasonal, and most importantly, they show how fun and satisfying eating healthy can be. In addition to the hundreds of Mediterranean recipes (accompanied by nutritional information), this book includes in-depth information regarding the diet itself, pantry must-haves, a complete FAQ on olive oil, and even recipes for homemade spice blends like Za’atar, Ras el Hanout, and Green Zhoug. Nearly every recipes features a “why it works” blurb on how the recipe came to be and why certain ingredients and processes are called for. 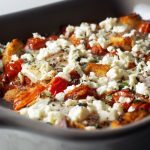 I love this information ATK adds to their recipes, not only because it explains the recipe and the importance of following it, but because there’s always a takeaway that can often be applied to future recipes. 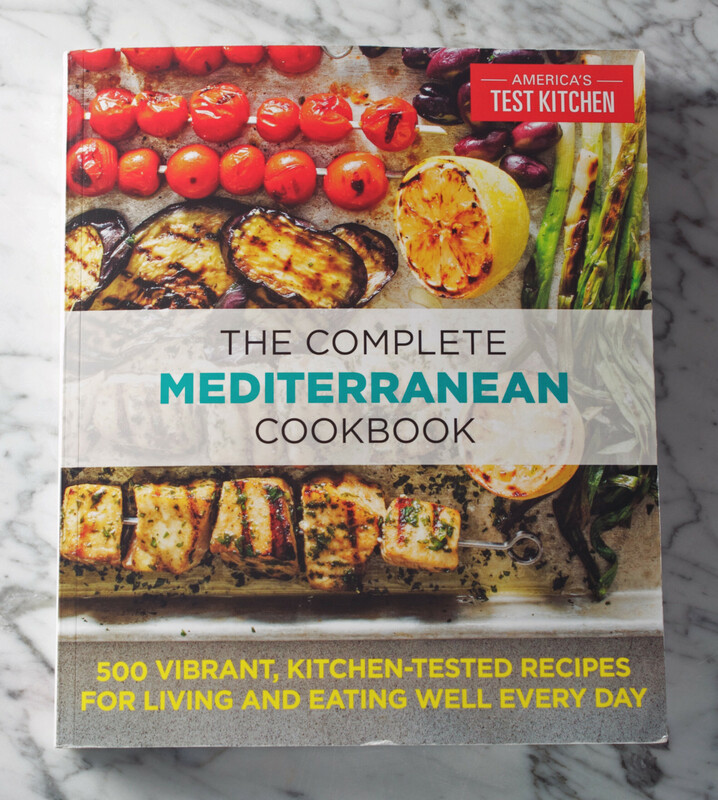 Each and every recipe in this Mediterranean cookbook is absolutely stunning and I can say with certain that there isn’t one recipe I wouldn’t try myself (I obsessively read it cover to cover). I particularly can’t wait to try the Olive-Oil Yogurt Cake, Grilled Swordfish Skewers with Tomato-Scallion Caponata, and the Chickpea Cakes with Fennel and Arugula. 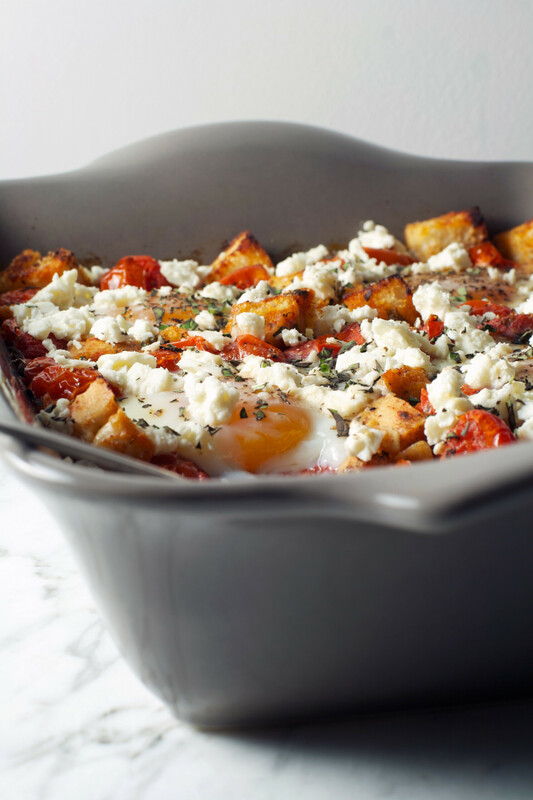 I choose to share this recipe for Baked Eggs with Tomatoes, Feta, and Croutons because it exemplifies how a simple ingredient list can lead to an incredible meal. Packed with flavor and texture, this dish surprised me, and I guarantee it will surprise you too. 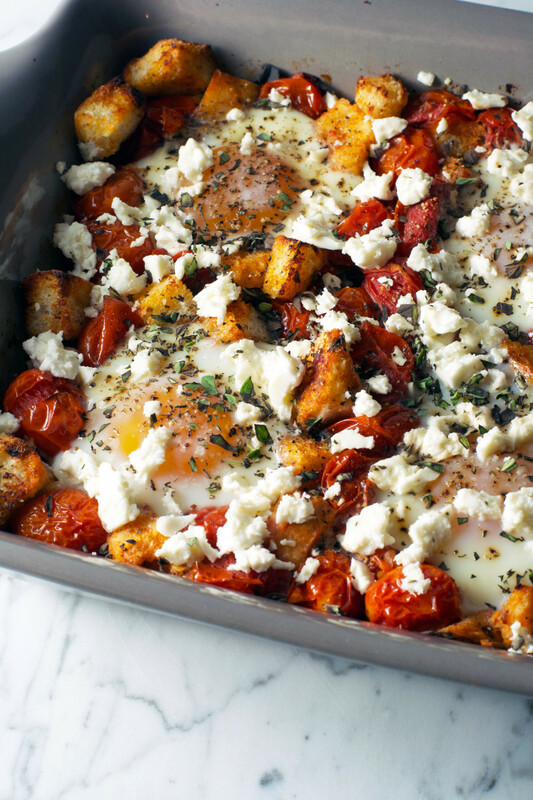 Make this healthy and hearty baked eggs and tomato dish tonight! 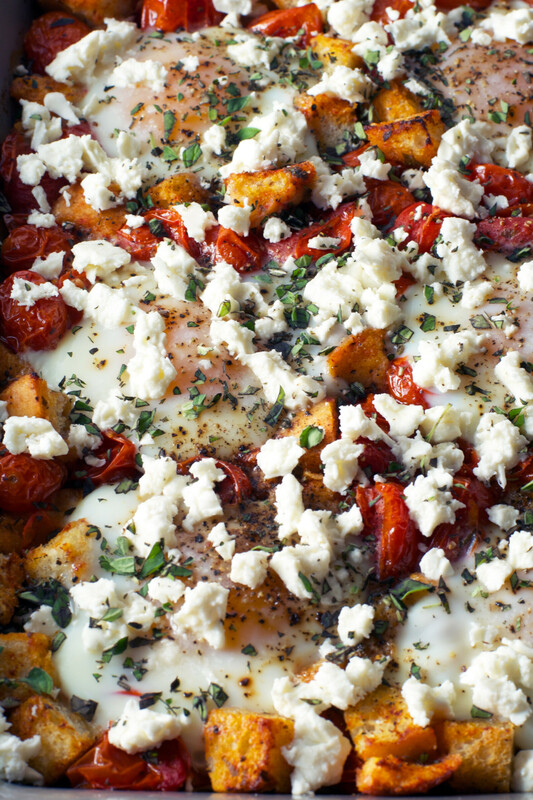 Easy to make and oh-so delicious, this vegetarian dinner (or breakfast) with please everyone. Adjust oven racks to upper-middle and lower-middle positions and heat oven to 450°F. Toss bread with 1 tablespoon oil in large bowl and season with salt and pepper. Spread bread into even layer in greased 13 by 9-inch baking dish; set aside. Whisk garlic, 1 tablespoon oil, 1 tablespoon oregano, tomato paste, 1 ½ teaspoons salt, sugar, and ¼ teaspoon pepper together in large bowl. Add tomatoes and toss to combine. 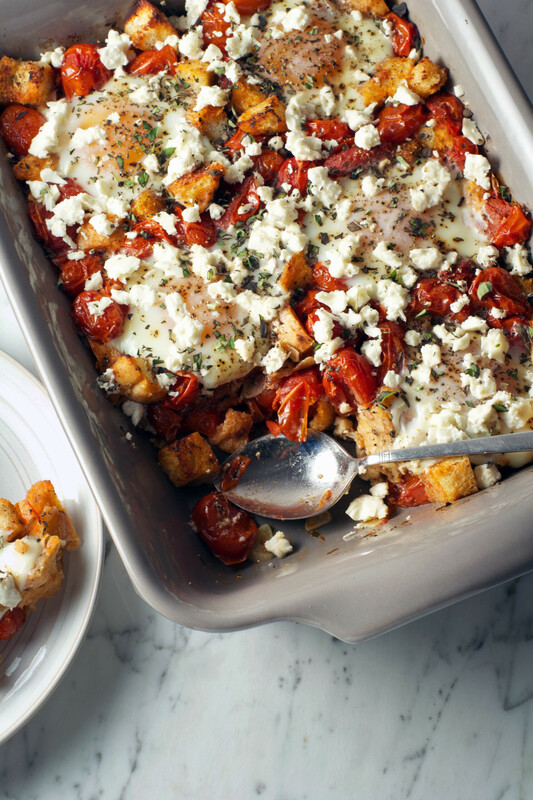 Transfer tomato mixture to a parchment paper-lined rimmed baking sheet and push tomatoes towards center of sheet. Scrape any remaining garlic and tomato paste from bowl into center of tomatoes; set bowl aside without washing. Bake bread on upper rack and tomatoes on lower rack, stirring occasionally, until bread is golden and tomatoes begin to soften, about 10 minutes. 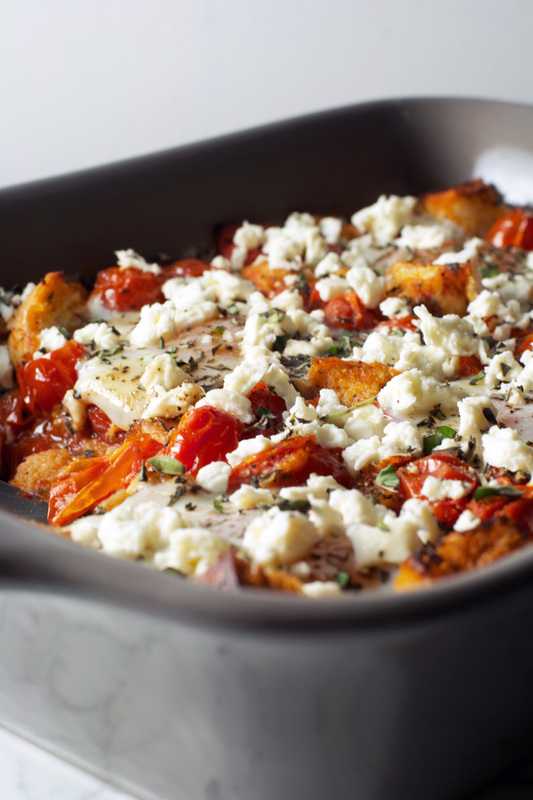 Remove croutons from oven and let cool in dish. Continue to bake tomatoes until blistered and browned, about 10 minutes. 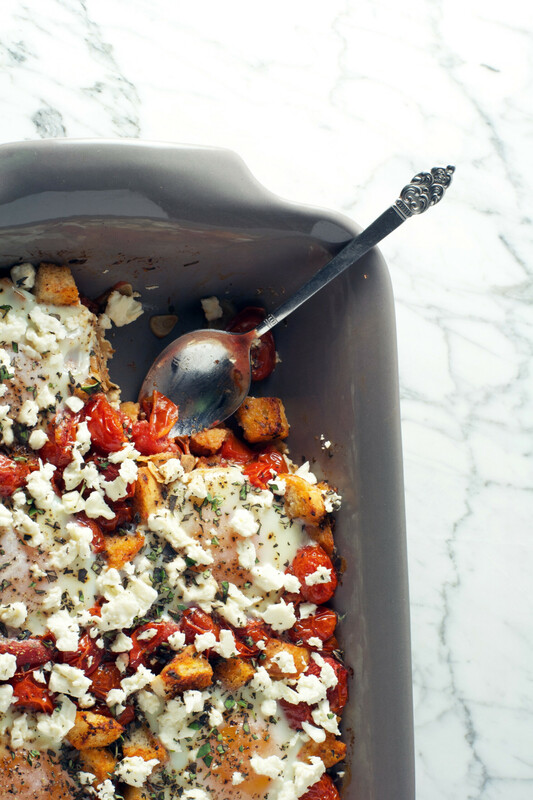 Add tomatoes and 1 tablespoon oil to croutons, gently fold to combine, and smooth into even layer. Make 6 shallow indentations (about 2 inches wide) in surface of bread-tomato mixture using back of spoon. Crack 1 egg into each indentation and season eggs with salt and pepper. Bake until whites are just beginning to set but still have some movement when dish is shaken, 10 to 12 minutes. Transfer dish to wire rack, tent loosely with aluminum foil, and let sit for 5 minutes. 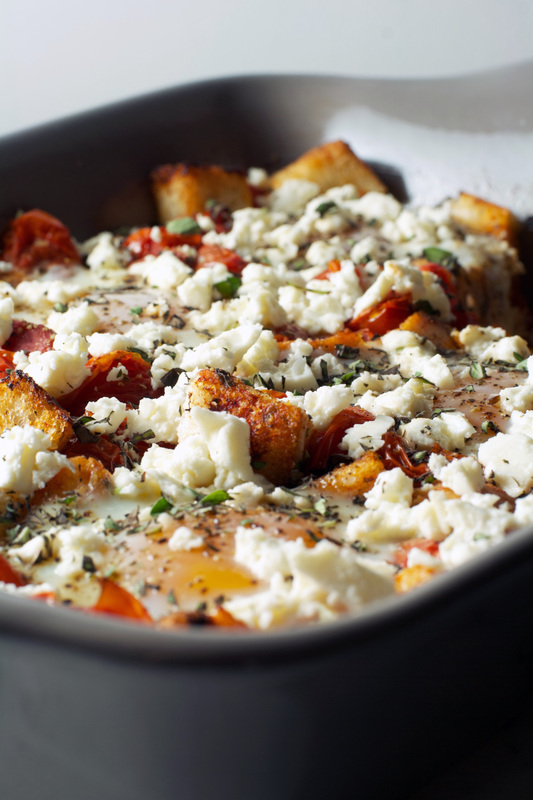 Sprinkle with feta and remaining 2 teaspoons oregano and drizzle with remaining 1 tablespoon oil. Serve immediately. from America’s Test Kitchen, this recipe is used with their permission. This post contains affiliate links. 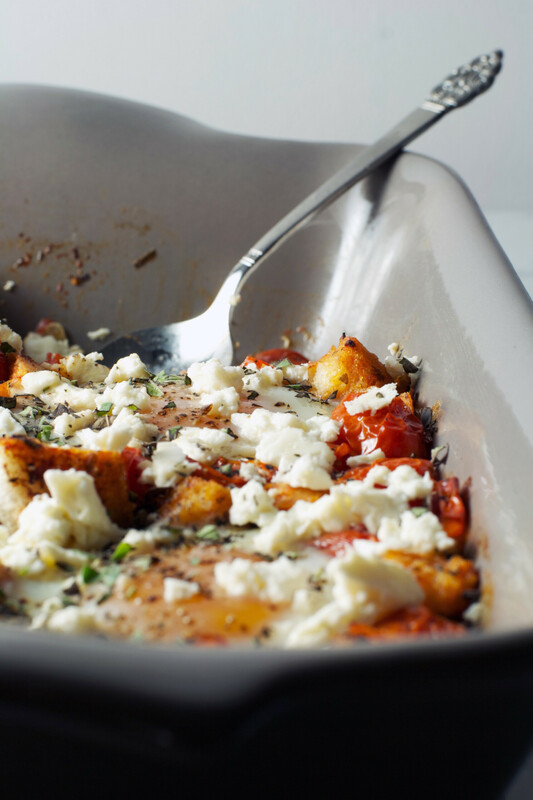 This dish is totally my cup of tea – can’t wait to make it. And i think I may have to get my hands on a copy of this book – it looks amazing! It’s so delicious, and packs a ton of flavor. I think you would enjoy the book, Jessica! Gorgeous photography, of course! This looks and sounds so amazing! Can’t wait to try it! Thanks Kaleigh! I hope you enjoy it! This looks so flavorful and filling! I am definitely going to order that book! It’s gorgeous. It definitely is! 🙂 I hope you enjoy the book! 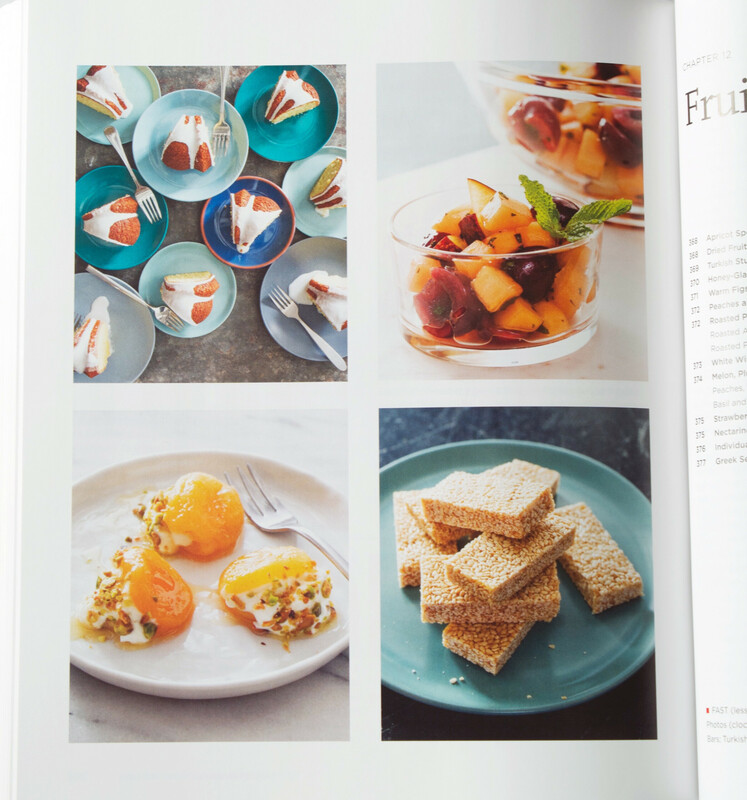 What a beautiful recipe and cookbook! I’ll have to add it to my library. 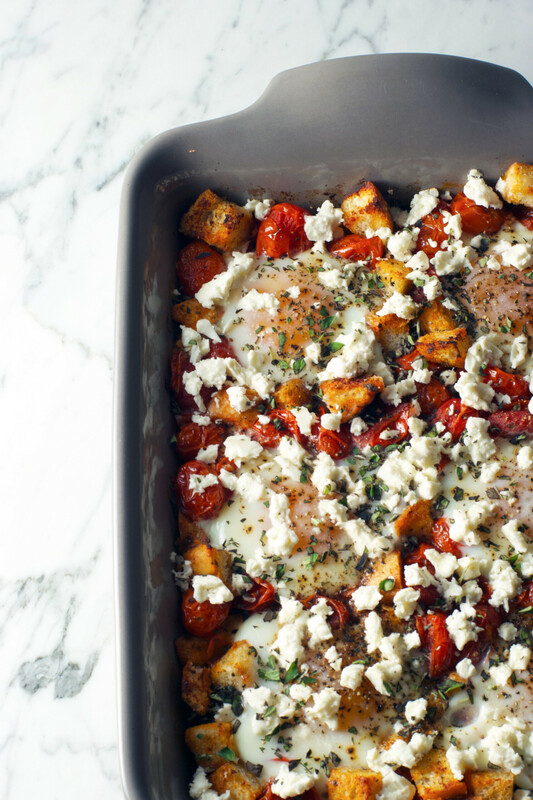 This recipe was super easy and oh so flavorful! It was just perfect for a weeknight dinner after a long day at work. 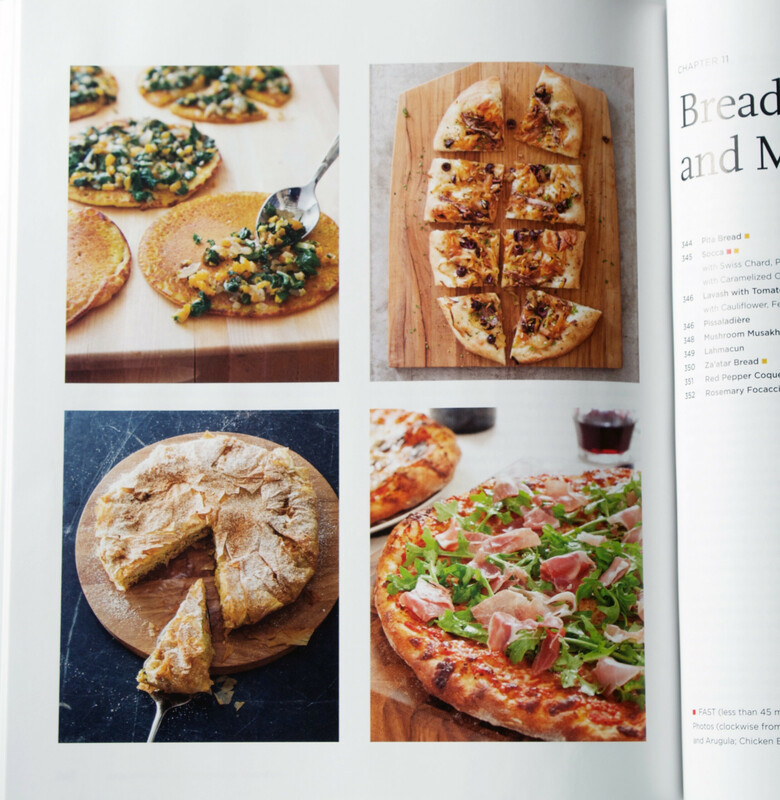 I need this cookbook! Birthday maybe……? I’m glad you liked it Lib! It’s one of my favorites. That would be a great birthday gift! Hate to say but I was disappointed in this recipe and I love Cooks Illustrated. Really wanted it to be amazing but it was just OK. The flavors were ok-smelled better than tasted. Was hoping for better. Actually looking for a Mediterranean Diet Cookbook with recipes that can be cooked quickly as a weeknight meals. Any suggestions would be greatly appreciated. I’ve read some reviews about this book that the recipes tend to be rather involved. Just need something quick, healthy and delicious. Hi Rob, I’m sorry you didn’t enjoy the recipe. I have looked around and tried to find a good Mediterranean diet cookbook, and I still come back to America’s Test Kitchen’s. Although some of their recipe do use quite a bit of oil, I find them easy to modify and decrease the oil where applicable. If I find any other cookbooks, I’ll be sure to reach out.